So since we’re still in summer, it’s time to go to the beach! I went for a whitewashed beach house, right on the waterfront – I went to Nags Head years back and this scene reminds me of the house that some friends and I had rented for that vacation. Maybe there’s not enough of the beach grasses here, but…well ya know 🙂 Copic colors for whitewashed house: C2, E00, E000; shadows C3, C1, C0; doors E31; windows B21. I had particular fun with the ribbon embellishment; there’s so much going on I wanted it to add to the design, not overpower it, and I think it works pretty well! The May Arts jute cord strikes just the right tone for the beach. Here’s the video tutorial….I kept it short, just showing you the most interesting bits. After you watch (and like! )—- go get beachy! I found your blog today thru Kristina Werner and I’m really enjoying all your videos; this is a real fav so far, (I’m from MA too!). Thanks for sharing! Amazing card! I love all the details, different elements and colors. Yum. 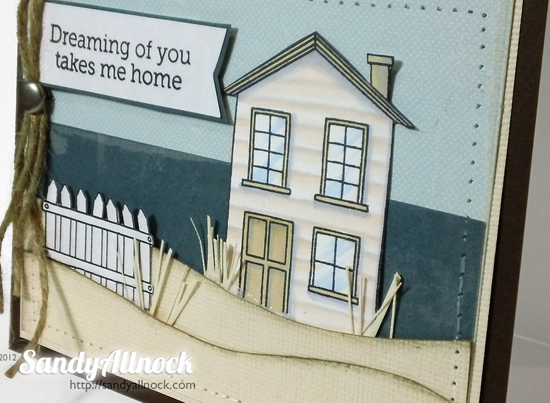 Wonderful video tutorial….the card is great! Thanks for putting so much of your time into this. Helps everyone get inspired. Very nice card with lots of pretty details! It makes me want to head back to the beach! This turned out terrific! Wonder if I can color that house now? Going to try! Sandy Thank you so much for the tutorials. The house card is over the top great. I do not have copics but am learning so much about coloring Have a great 4th. Another beautiful card and great tutorial. Looking forward to this week’s posts! Sandy, This card is AWESOME! I absolutely LOVE it! Great job. Thanks for all your hard work. The like button didn’t work for me either. Hi Sandy, this is one of my favorite cards you’ve ever made!! It is beautiful; I love everything about it, right down to the clapboard effect on the cottage. Lovely card and very helpful tips.